Who do you listen to when making a decision? Where do you look when choosing where to spend your money? Is it all about recommendations? So, the time has come. Your current car has been a loyal partner on the road for a good few years but it’s time to start looking for a new one. There’s no denying that getting a new vehicle is something you put a lot of thought into. After buying a house it’s one of the biggest expenses you are likely to have, so it’s understandable that making a decision can take time. Buying a car is not like purchasing a bar of chocolate. When you buy chocolate, or anything else small and at a much lower cost, it’s often done on impulse and requires very little, if any, thought. What factors are considered when buying a new car? There are a lot of things to consider when buying a new car, including safety, driving comfort and price. In 2018, Statista conducted a survey in which they asked their users in the UK and America the key influencing factors that went into making their decisions when choosing a new vehicle. When asked, 60% of people in the UK responded that the most important factor they used to decide on a new car was fuel efficiency. Where the cost of fuel is concerned, the more miles to the gallon that can be reached the better for UK-based consumers. As of the end of January 2019, the average price of a litre of petrol was £1.19, with a litre of diesel costing an average of £1.28. In comparison, in the US, 65% of consumers who were asked by Statista rated safety as the most important factor they considered when looking at a new car to purchase or lease. 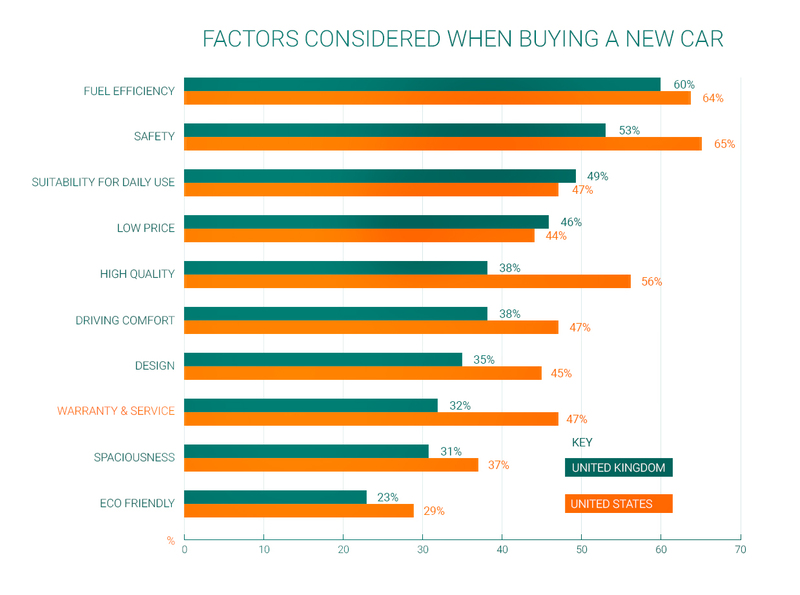 Other factors that were taken into account by both UK and US consumers when it came to choosing and buying a new car included suitability for everyday use, quality, driving comfort, warranty and customer service and design. Surprisingly, the desire for a low price was not higher in importance for either UK or US consumers. In the UK it came fourth on the list, below fuel efficiency, safety and suitability for everyday use. In the US it came 8th on the list, above only spaciousness and environmental friendliness. For both UK and US car buyers, environmental friendliness was the least important factor that people thought about when looking at their new vehicle. In the UK, where the Ford Fiesta was the biggest selling new car on the roads in 2018, just 23% of consumers who took part in the Statista survey said that they had taken environmental friendliness into consideration. In the US 29% of those asked stated that they considered the environment when buying a new car. This was further evidenced in the most popular car for 2018 in the US, the Ford F-150 which gets up to 22 combined mpg. What OSV found when they spoke with new car buyers? As part of our own research, in 2018, we spoke with OSV customers who were looking to buy or lease a new car. We wanted to find out which car features had driven them towards the vehicle they ended up purchasing. For our customer-base, the feature that was considered most important was the interior space that the car had to offer. 100% of the people our team asked stated that they were interested in the amount of space that the vehicle had, including rear storage, leg space and space for children and animals. Performance and Equipment Levels were of interest to 62.5% of the customers we spoke to, while Build quality and Brand, Styling and Comfort were important to only 37.5%. Surprisingly, just 12.5% felt that the way the vehicle handled was something that they thought about when looking for a new car. What influences you when buying a new car? In 2018 several surveys were conducted that looked into the key influences that consumers rely on when they are looking to make a large purchase. Both surveys, one conducted by the Spiegel Research Center (SRH), the other by Jay Baer and Daniel Lemin from Convince & Convert Consulting, looked at what the most common and convincing influences were when it came to the larger purchases made by an individual. In their report, Chatter Matters, Baer and Lemin focused on the value of word of mouth, highlighting that the opinion of others was most influential when it came to how people made decisions on their biggest purchases, which include cars. SRH focused their report, ‘How Online Reviews Influence Sales’ on the value of reviews, looking at many aspects of the online review and how they can affect online purchases and the view of online consumers. The report looked at various components of the review, including star ratings, the number of reviews and the status of reviewers (verified buyers vs anonymous) and the effect they had on its perceived credibility. During their research, SRH discovered that having more reviews and receiving perfect ratings were not felt to be the most reliable influences on people who are considering making a large purchase. When they were asked, people who participated in the research said that they felt five-star reviews were too good to be true and, because of that, considered less trustworthy than reviews that were rated between 4 – 4.7. Reviews matter, whether they are positive or negative, posted online or shared in a text message. Chatter Matters looked at the value of reviews and the many ways in which they are shared, as well as how they were perceived. When asked, 27% of people who took part in the Baer and Lemin research said that if they were purchasing food, or something with a high value like a car or house would trust a recommendation or review from a friend more than they would comments on a website or from a stranger. Simply stated; yes, reviews matter. When you get an email from an Amazon Marketplace customer requesting a review, it’s not because they want to fill your inbox, it’s because your experience really matters. Every single review that a business gets is an important learning experience. So, even if your experience wasn’t 100% positive, whatever you’ve written can be used to help that business improve. So, if you get an email from any business asking for a review, they aren’t asking just to boost their ratings. The company is also asking because they help with training, provide a guide to areas that need improvement and also give potential customers an insight into what to expect from the product or services the company delivers. Reviews are valuable, not just to the business, but also to the customers that come after you; influencing how they feel about the service or product they are spending money on and the business that they are getting it from. Every review matters so, the next time you get a review request in your inbox, remember it’s not only the stars a company is after. Your feedback is important.